The Queen of Riches Slot by Big Time Gaming is one of the famous Mega Ways online slots. Big Time Gaming itself has developed this incredible feature. With this you play every spin in a new ways to win configuration. 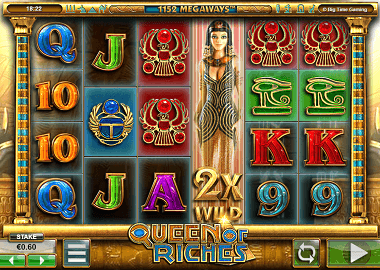 The Queens of Riches has 6 reels with up to 7 symbols and up to 117,649 ways to win. When you start a game you can see above your reels a display that shows you how many ways to win you play. Other bonus features are the Stacked Wild feature and the Clone reels feature. From a minimum bet of 10p you can spin the reels up to a maximum of £40. Symbols & Payouts: The symbols of the Queen of Riches differ in high value and low value symbols. The theme here is ancient Egypt and thus land on your reels 3 different Egyptian hieroglyphs (blue, red and green colors) and a pyramid. These are your more valuable symbols and pay up to 30x your bets. The low paying symbols included the playing cards symbols 9, 10, J, Q, K and A. Queen Cleopatra itself is the Games Wild symbol which can land wild on your reels as a full reel symbol. Game Play and Wild feature: The Mega Ways Slot Queen of Riches can land up to 7 symbols per reel each spins. It’s a unique feature which is available only with Big Time Gaming slots. Wild multipliers also increase the ways to win up to 7x per reel. This means every spin can generate up to 117.649 ways to win. The games Wild symbol is Queen Cleopatra and it can appear as a full reel wild symbol. The winnings are paid with a win multiplier. If the Wild symbol lands on 7 symbols you will receive a 7x multiplier. If you manage that even on 2 reels you win with a 49x multiplier. Free Spins feature: The only bonus feature of the Queen of Riches Slot is the Reel Clone feature.This feature can be activated at random with each new spin. You will then get between 2 and 6 identical reels. So you are able to clone full reel Wilds as many as five sets of Full Reel Wild reels and each multiplier is randomly assigned. Thus, there are only 2 bonus feature at Queen of Riches slot. Still, you can make some huge profits. The Mega Ways and Clone reels with multipliers deliver up to £ 120,000 top prize. The Queen of Riches Slot by Big Time Gaming is a must for enthusiastic slot players. All Mega Ways Slots are a big hit, because with every spin you can get awesome winnings. If you want to try the Queen of Riches Slot for free, you can open the game by clicking on the banner at the top. Recommended Big Time Gaming casinos can be found in the table below. The Spin Station, Spin Rider and Spinland Casino offer you excellent bonuses and free spins when you register at the casino. You can find more Big Time Gaming slots for free on our Big Time Gaming review page.